Taipei, June 28 (CNA) The number of enrollments in Taiwan's tertiary institutions by Southeast Asian students in academic year 2017-2018 was more than 41,000, higher than the government's target of 40,300, Acting Minister of Education Yao Leeh-ter (姚立德) said Thursday. At a press briefing on the effectiveness of a government program to foster talent under its New Southbound Policy (NSP), Yao said students from Southeast Asian countries accounted for 35 percent of the tertiary enrollments by foreign students in Taiwan in the current academic year. He said the program is aimed at helping schools in Taiwan and the NSP target countries to work together to cultivate talent and promote professional exchanges. As part of the program, the government had set a goal of attracting at least 40,300 students from the target countries in the 2017-2018 academic year but has surpassed that target by more than 700, Yao said, adding that the new target for the next academic year is 58,000. Meanwhile, the Taiwan government is planning to introduce technical and vocational training programs for students from the NSP target countries, particularly Malaysia, the biggest source of foreign students in Taiwan, Cabinet spokesman Hsu Kuo-yung (徐國勇) said at the press briefing, citing Premier Lai Ching-te (賴清德). At a Cabinet meeting earlier in the day, the premier also issued a directive for the Ministry of Education to devise a system specifically for the recruitment of tech-voc students from the target countries, in light of China's aggressive strategies to lure foreign talent, according to Hsu. 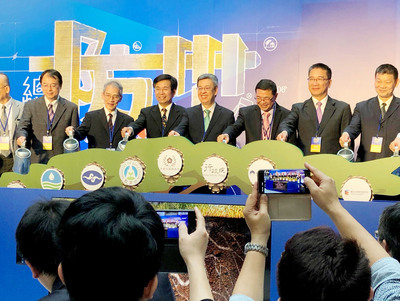 Lai noted that the National Development Council has proposed a draft act for new economic immigration, which is aimed at attracting foreign professionals, technicians, business immigrants and Taiwanese expatriates to supplement Taiwan's workforce, Hsu said. The premier also said the Ministry of Foreign Affairs should encourage Southeast Asian officials to come to Taiwan for training purposes as they can also help with Taiwan's efforts to recruit students from the region, according to Hsu. Initiated by President Tsai Ing-wen (蔡英文), the New Southbound Policy seeks to strengthen relations with Southeast and South Asian nations, Australia and New Zealand.